So Autumn is well and truly in full swing around here. 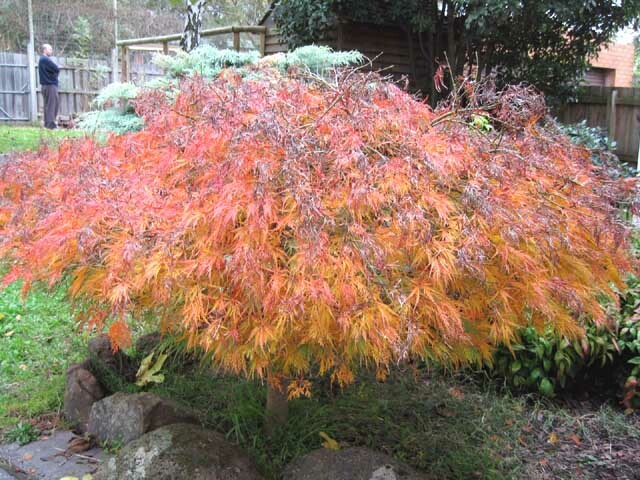 We have a gorgeous Mini Japanese Maple in our backyard and it is just bursting with autumn colours (see pic above). Haven't posted in almost a week, but I have been soooo busy. Been planning and organising our church's young adults retreat which is this weekend. And on top of that I seem to have a stack of other things that I've managed to put on my plate this week. So definitely no scrapping this week. Should be a good weekend though. I have put a stack of work into it so I hope it goes well. A little nervous actually but hey, I can only do my best. On the weight loss front, I have lost my first kilo! So I am pretty stoked with that. Have been working out at least once a day (for around 30mins at a time) but most days I've been going out their morning and night! Feeling really good and different to any other time that I've done something like this. I tend to make excuses for myself as to why I can't go and exercise and it seems that my "Just go and do it and stop whining" voice, is winning over. So 1 kg down, 9 to go!! May not get a chance to post before the weekend, so have a good one and I'll be back Sunday night! Good on you MEGAN!I need to start walking again to lose some weight and to also feel fitter.It's amazing how much better you feel isn't it when you lose some weight and gain more energy! Have fun on the weekend! Sounds like you have been working hard organising everything! congrats girl....keep up the good work. the 1st couple of kilos are the hardest but we know you can do it. good for you. hope you are having a great weekend. hugs. I was sure I'd left a post on this... don't know what happened to it! Love that photo Megan. Hope your retreat is going well. Looking forward to an update when you get home.